An overt RDP login to the server. Some sort of application virtualisation; e.g. a published app. The latter two are set up by IT and are becoming more popular with the availability of cheap powerful servers. These also facilitate use of WiFi which is not possible when running across the network. To move Match-IT between servers, copy the Match-IT folder from one server to another and then repoint the workstation connection solution to the new location. Users need full control of the Match-IT folder. The first time Match-IT is run it needs local admin access to do some housekeeping. It will let you know if it does not have this privilege. Usually right-clicking and selecting “run as administrator” will allow Match-IT to do what it needs. It may need an admin password depending on how IT have set up user profiles. This only needs doing once. There is a service that needs to be started on the new server but it’s easiest to call us to do it; for example over Teamviewer. It takes about 5 mins. Match-IT is a large application and some virus checkers detect false positives. Also the data files change many times per second which can have negative performance effects if virus checkers are active on them in real-time. The Match-IT executables have built in checks and will not start if they have been modified. We strongly recommend that you exempt the whole Match-IT folder on the server and also c:\programdata\match_it which contains a runtime copy. If starting Match-IT with a simple shortcut we also strongly recommend exempting c:\programdata\match_it on workstations as well. If the printers used by Match-IT now have different URLs, the Match-IT print queues will need a tweak and again it’s easiest if we do that if you let us know what they are. (*) Virus checkers include mapped drives by default, which can obviously cause serious problems if the data files are changing frequently on the server. If you have to use a mapped drive, we strongly recommend exempting it on the workstations. 1. A virus/malware checker(s) is checking the Match-IT data files in real-time on the server. It is essential that the Match-IT data folder is exempt because the files changes so frequently (many times per second). This is perfectly safe because the data files are not executable programs. 2. Use of mapped drives to access Match-IT is not recommended for the same reason. Local virus checkers on PCs check mapped drives to other computers by default, so you have to exempt the mapped drives on each PC and in each virus/malware checker on those PCs. This can usually be done with a global policy by your IT guys. But new PCs can still be a problem because they often come with a free one year AV program installed which starts checking mapped drives. We recommend sharing the Match-IT folder on the server and then connecting to it using UNC paths, but this is only of benefit if the mapped drive used to access Match-IT is also removed from each PC. This also includes any other mapped drives that happen to include the Match-IT folder. Either exempt the drive or preferably use UNC paths. 3. Dodgy network cards. Surprisingly frequently, network cards fail and while doing so cause problems. We have no idea how to detect this other than start one PC at a time and see when Match-IT slows down. 4. Slow/degrading server disk. Match-IT makes high demands on the server disk and it’s needs to be super-fast and efficient. 5. Use of WiFi. If you use a laptop to run Match-IT please make sure that it’s physically plugged into the network. Absolutely do not rely on WiFi. 6. Use a dedicated server. Because of the relative cheapness of servers these days and the critical nature of Match-IT to our customers, many choose to have a dedicated Match-IT server; especially if the load from other server software components (like ACT) is high. Access is either by UNC paths (no mapped drives) or a published app so everybody is in fact running Match-IT on the server. Note that the latter has outlook licence and printing implications. We have a UK customer with a Match-IT server in mainland Europe and it is ultra-reliable; they use a published app for access. What is a dis-assembly method? The Product Manual briefly mentions a dis-assembly method, but what does it do in practice and when would you use one? This article attempts to answer those questions by means of an example. Say for example that you use parts called A, B and C in your methods, and you can buy them from various suppliers as usual. However, let’s say that A, B and C are in fact parts of a connector (for example) and you can buy a whole connector cheaper than the component parts. By using a dis-assembly method attached to the connector, Match-IT will buy it and create a works orders to take it apart as needed; i.e. if it needs to acquire an A and/or B and/or C – which will have been defined as parts in other methods. “PART (self)” can be added to the method by dragging in a PART record from the list on the right – it defaults to “(self)” – i.e. use myself as the kit. Similarly the output records can be dragged in and then edited to define what they create; A, B and C in this case. If the connector cost £10 the cost of A, B and C will be £4, £4 and £2. Any method requiring a whole connector will just have a “PART X” in its method somewhere as per normal; nothing special will happen; the connector will be bought and used like any other part. If an A, B or C is required in a method, Match-IT will buy a whole connector X, create a works order to take it apart, using itself as kit and attach 3 outputs A, B and C, which will need to be booked in as the outputs of the works order. Unless of course there is some A in stock, in which case that will be used instead. This is a very simple example. The dis-assembly method can also have resources to do the work and they will be costed as per normal. Other parts and/or tools may also be needed. How do I cancel a shutdown? When you use the resource shutdown facility, what you are in effect doing is adding resource weeks to the system. Resource weeks are records that define availability. Each record spans one week and has a start date. Then locate and Remove the relevant resource week records one by one. How do I print using a different paper design? Select the second tab of the printing window – Print Options. Tick the Use an Alternative paper checkbox. Select the desired paper design using the ellipses button. 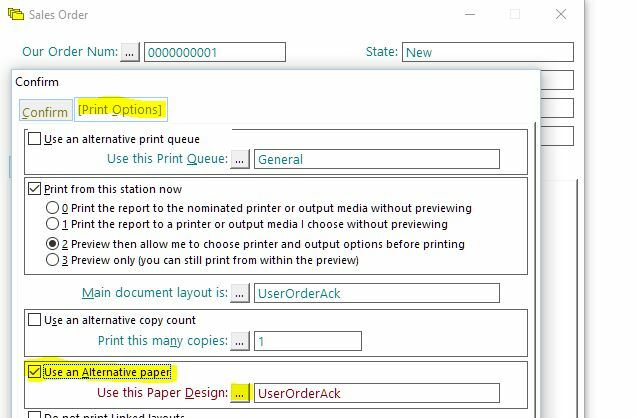 The screenshot below shows an example of printing a sales order acknowledgement; you would use the ellipses button to select a paper design other than UserOrderAck. We build Match-IT every night and you can always upgrade to the latest release of the current version. Sometimes we’ll tell you that a feature or fix will not be available until a particular version is released, which we will announce in a news item. You can subscribe to news items via the footer of this website to get email updates, or by following us on facebook or twitter. What is free issue stock? 1. There is a flag in the material record – Is Free Issue. Note that the flag is against the material, not a PART in a method. 2. When this flag is set, it triggers the scheduler to create a new type of purchase line – free issue – and associate the customer for the schedule demand with it. 3. There is a free issue purchase schedule similar to the normal purchase schedule. 4. Lines in the free issue purchase schedule can be approved and printed, but it’s optional. 5. The event diary system nags for free issue stock, as for a normal purchase. 6. When booking-in goods, selecting a free issue item against a non-approved purchase line will auto approve it. 7. You can buy things directly from customers if you wish, there is no need to create another supplier record for them. Similarly, you can sell things to suppliers. 8. 6 and 7 are possible because you can associate two account references with a supplier/customer. One for use when selling and the other for use when buying. The appropriate account code will be passed to the accounting system. They can be the same.